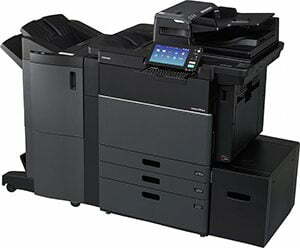 One of the main photocopier companies that Midshire partners with is Toshiba. Toshiba is a leader in business technology innovation, entering the photocopier market in 2003. Midshire partnered with Toshiba in 2015 and has quickly become a firm favourite with our customers, particularly with respect to their economical and environmentally friendly nature. At Midshire, we supply and service the e-STUDIO range of Toshiba photocopiers. Working closely alongside Toshiba, we are able to find the perfect print solutions to fit any organisation. This range of Toshiba photocopiers brings efficiency, style and striking image quality. The five compact models are loaded with high-performance functionality and features, delivering the answer to all document workflow needs. Starting at a moderate speed of 2oppm, the e-STUDIO range increases in page speed, peaking at 75ppm. As the speed increases, understandably so does the price of Toshiba photocopiers. Additional price fluctuations come with the addition or removal of finishing equipment, paper trays and software’s. Midshire specialises in working with customers to find the right machine configuration and specification for their business, at a budget they can afford. Toshiba is committed to the environment and has devised a scheme, with the help of carbon-offsetting experts, called the Toshiba Carbon Zero scheme. This scheme means that Toshiba can offset the carbon footprint of any Toshiba photocopier or multifunctional printer at a set number of pages. The Toshiba Carbon Zero programme ensures Toshiba and customers are working together to support projects around the world to help prevent further damage to the environment. All Toshiba photocopiers can be either purchased outright or financed on a lease. Leasing is the most cost effective way to fund your new Toshiba photocopier, as you can spread the cost of the equipment over 3 to 5 years. You will pay equal, fixed amounts either quarterly or monthly. By leasing your device, you may find you can afford a machine with a higher specification than you would by purchasing. It also allows for greater flexibility in the future, when wanting upgrade your equipment. Midshire’s key area of expertise falls into Managed Print Services. All Toshiba photocopiers can be placed on a Managed Print Service and our service team will look after your device for the duration of the contract. As part of this service, Midshire will install the device on-site at your premises, provide comprehensive operator training to staff, take meter readings, deliver toner, service the machine on a regular basis and book engineers for any unforeseen emergency breakdown repairs if required.